A runaway pulsar with an extraordinary jet trailing behind it has been found. This pulsar — a spinning neutron star — is moving between 2.5 million and 5 million miles per hour. Behind the pulsar there is a tail that stretches for 37 light years, making it the longest X-ray jet ever seen from an object in the Milky Way. This tail has a corkscrew pattern, indicating that the pulsar is wobbling like a top as it spins. 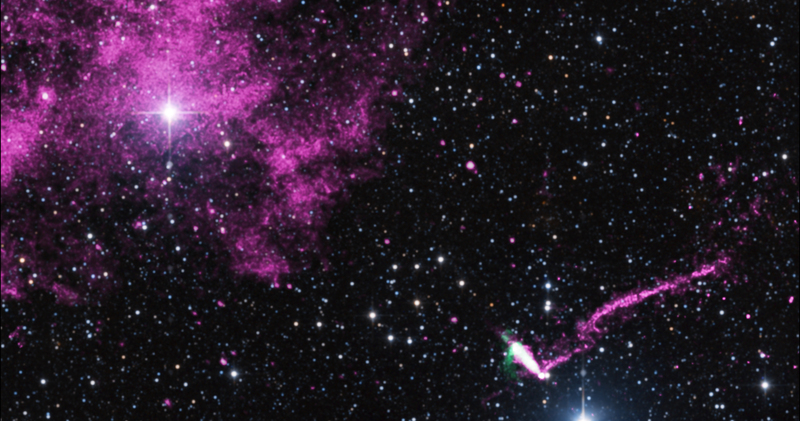 An extraordinary jet trailing behind a runaway pulsar is seen in this composite image that contains data from NASA's Chandra X-ray Observatory (purple), radio data from the Australia Compact Telescope Array (green), and optical data from the 2MASS survey (red, green, and blue). 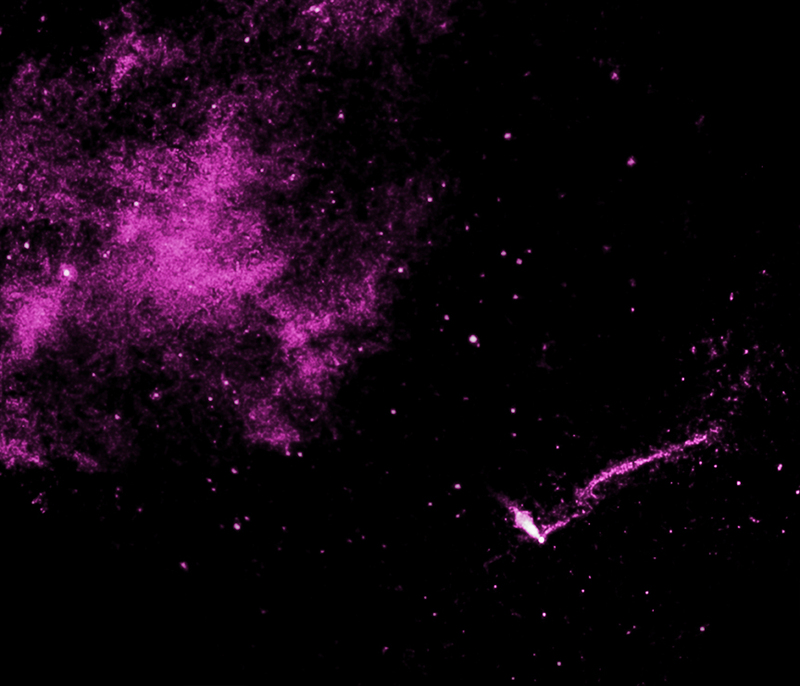 The pulsar — a spinning neutron star — and its tail are found in the lower right of this image (mouse over the image for a labeled version). The tail stretches for 37 light years , making it the longest jet ever seen from an object in the Milky Way galaxy, as described in our press release. The pulsar, originally discovered by ESA's INTEGRAL satellite, is called IGR J11014-6103 and is moving away from the center of the supernova remnant where it was born at a speed between 2.5 million and 5 million miles per hour. This supersonic pace makes IGR J11014-6103 one of the fastest moving pulsars ever observed. 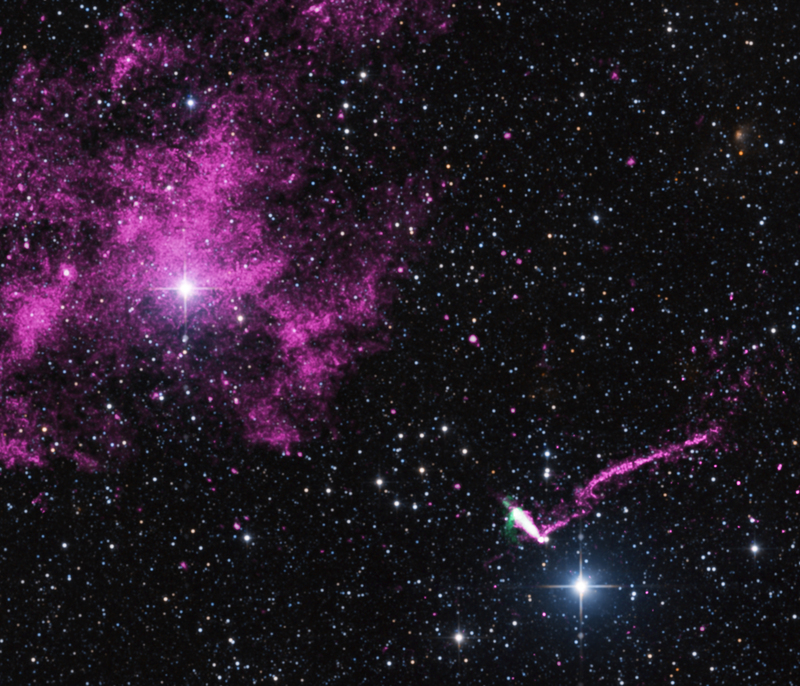 A massive star ran out of fuel and collapsed to form the pulsar along with the supernova remnant, the debris field seen as the large purple structure in the upper left of the image. The supernova remnant (known as SNR MSH 11-61A) is elongated along the top-right to bottom left direction, roughly in line with the tail's direction. These features and the high speed of the pulsar suggest that jets could have played an important role in the supernova explosion that formed IGR J11014-6103. In addition to its exceptional length, the tail behind IGR J11014-6103 has other interesting characteristics. For example, there is a distinct corkscrew pattern in the jet. This pattern suggests that the pulsar is wobbling like a top as it spins, while shooting off the jet of particles. Another interesting feature of this image is a structure called a pulsar wind nebula (PWN), a cocoon of high-energy particles that enshrouds the pulsar and produces a comet-like tail behind it. Astronomers had seen the PWN in previous observations, but the new Chandra and ATCA data show that the PWN is almost perpendicular to the direction of the jet. This is intriguing because usually the pulsar's direction of motion, its jet, and its PWN are aligned with one another. One possibility requires an extremely fast rotation speed for the iron core of the star that exploded as the supernova. A problem with this scenario is that such fast speeds are not commonly expected to be achievable. A paper, led by Lucia Pavan of the University of Geneva in Switzerland, describing these results appears in the February 18th issue of the journal Astronomy & Astrophysics and is also available online. Other authors include Pol Bordas (University of Tuebingen in Germany), Gerd Puehlhofer (Univ. of Tuebingen), Miroslav Filipovic (University of Western Sydney in Australia), A. De Horta (Univ. of Western Sydney), A. O'Brien (Univ. of Western Sydney), M. Balbo (Univ. of Geneva), R. Walter (Univ. of Geneva), E. Bozzo (Univ. of Geneva), C. Ferrigno (Univ. of Geneva), E. Crawford (Univ. of Western Sydney), and L. Stella (INAF). Wow Spectacular images of the universe - that something so deadly could look so intriguing and exquisite. But to see the why, the how, measure its nature, examine forces from the mind's eye and know without this violent torrent, we would not come to be. We are virtual tourists blind to the present peering deep in time to a cosmos developed so time can even exist. None of this work product could be without the confluence of resources, interests, and human acceptance. I appreciate your conveyance, whoever you are, of these fine images. Where are the anti-matter telescopes or the electromagnetic field imaging - a fine addition to the spectacular and informative photographs presented here. Perhaps they will be next presented here. which used a Chandra observation that was only about an hour and a half long. You can see hints of the jet, but it was too faint to determine what the feature really was. The recent, follow-up Chandra observation reported here, was almost 14 hours long and provided much better data to see the faint jet, along with its corkscrew structure. The tail is 37 light years long. It's seriously screwing with my mind. If the jet's behavior is related to the wobbling of the pulsar, why would the stream maintain the corkscrew shape for 37 light years in length rather than dissipate in the vacuum of space? It seems plausible that the spiral motion of a charged particle in a magnetic field could be applied to this jet. The magnetic field would be a result of interstellar Birkeland currents, which also exhibits a kink instability in this example. It is fun to think that in the visible light you can see stars normally, but in the X-ray wavelengths you see that there is much more than just stars. 23,000 LY region as a drive to 2300 LY data. X-ray: pink, radio: green and optical red, green and blue.